The Parental Leave, Family Leave, and Short-Term Family Leave in the State of Vermont is a family leave law poster by the Vermont Department Of Labor. This poster is mandatory for some employers, including employers who employ 10 or more people (for parental leave) or 15 or more people (for family leave). This poster must be posted in a conspicuous place by all employers who regularly employ ten or more people so that all employees can see it. This poster describes who is covered by Vermont's Parental Leave Law as well as the Family Leave law, as well as how often leave can be taken, for how long an employee can leave, if leave is paid or not, and exceptions to this law. It appears you don't have a PDF plugin for this browser. 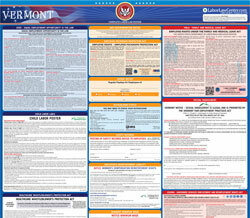 Please see the link below to download vermont-wh-14-parental-family-leave-poster.pdf. week over the course of a year. who work an average of 30 hours per week over the course of a year. employee’s parent, spouse or parent-in-law. have	a	significant	adverse	impact	on	the	employee’s	family	member. which the worker is entitled. seniority, and other terms and conditions. substantial and grievous economic injury . hts than the law requires. EMPLOYEES ARE PROTECTED FROM RETALIATION OF ANY KIND IN CONNECTION WITH THE ENFORCEMENT OF THIS LAW. disabilities. 711 (TTY/Relay Service) or 802-828-4203 TDD (Vermont Department of Labor).